Take care of the fuss of this Almond Coffee Cake with a surprise ingredient. 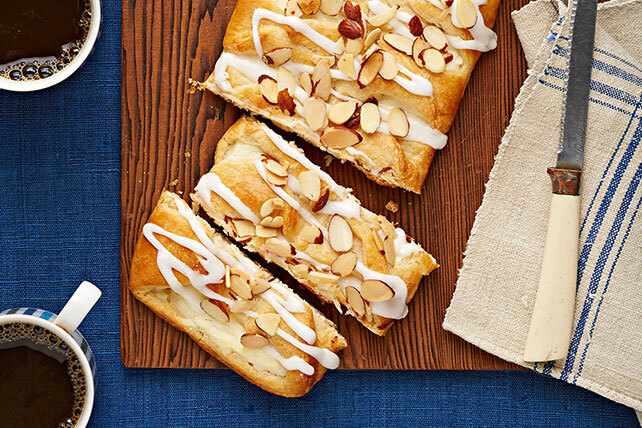 You don't need mad baking skills to make this scrumptious Almond Coffee Cake! Mix cream cheese, 1/4 cup sugar, 1/2 tsp. extract and egg yolk until blended. Unroll crescent dough onto center of baking sheet; press seams and perforations together to seal. Spread cream cheese mixture into 3-inch-wide lengthwise strip down center of dough to within 1/4 inch of short ends. Make cuts, 1-1/2 inches apart, down both long sides of dough to within 1/2 inch of cream cheese mixture. Starting at one short end, bring opposite strips of dough together over filling, then twist gently in center to secure. Whisk egg white until foamy; brush onto dough. Bake 18 to 22 min. or until lightly browned. Cool 15 min. Mix remaining sugar, extract and milk until blended; drizzle over coffee cake. Sprinkle with nuts. You'll know it's a special occasion when you get to enjoy a serving of this coffee cake. Prepare recipe as directed, except do not bake. Refrigerate up to 24 hours. When ready to serve, bake (uncovered) as directed.